If there’s ever a sign that an area is on the upswing, it’s when it starts to pick up some good, delicious breakfast joints. It wasn’t all that long ago that almost all of the options for a decent breakfast in downtown Detroit had the words “Coney Island” associated with them, or you had to nervously wonder if the in-house breakfast at your hotel was halfway decent. But in relatively recent history, more than a few decent breakfast options have become available: the Hudson Cafe, the Parks and Rec Diner, and Dime Store all being locations that were on my radar, and since my walk to Cobo Hall took me right by the Chrysler Building (formerly the “Dime Bank Building”), I figured it would be a good opportunity to stop in and check out Dime Store. Dime Store is just inside the lobby of the Dime (err, Chrysler) building, in a funky converted space that builds upon an open kitchen concept, and somewhat nicely works a Liberty Dime visual into the artwork (despite the name, I’m pretty sure the space never was an actual dime store). Seating-wise, it’s a bit of a cozy space with a lot of relatively tightly packed wooden seats that appear to be salvage from an older school, but it managed to get seating for maybe 6 dozen or so people, including the bar seating. 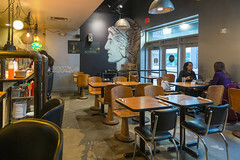 Menu-wise, the concept here is your basic “New American” cuisine, with a menu that seems to primarily focus on omelets, Benedicts, hashes, and breakfast sandwiches, with the obligatory focus on local area farms for the farm-to-table vibe. They seem to do a good job integrating those local ingredients into dishes, the default side for most of hte dishes isn’t potatos, but a lightly dressed green salad, and a good number of the dishes also feature local vegetables and pestos. 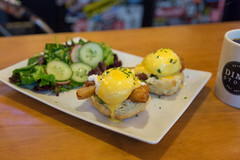 Myself, I decided after a brief flirtation with a “Coney Island Benedict” on the specials menu to instead go for a regular menu item: the Spicy Belly Benedict, with seared pork belly, jalapeno pesto, and Hollandaise on a housemade biscuit. And I’ll have to say, this dish worked from top to bottom. First of all, in a world full of disappointing, leaden, uninspired biscuits, the fundamental building block of the Benedict was a well done biscuit with a nice buttermilk tang and a good crumb. Add in two good 1/2 inch thick slabs of nicely seared pork belly, a seriously good and spicy pesto, and two perfectly poached eggs, and all the foundation is intact. Add in a well-done lighter but still tangy Hollandaise, and this was a great riff on the Benedict. And, as I mentioned above, a nicely executed, perfectly-dressed green salad rounded it out nicely. 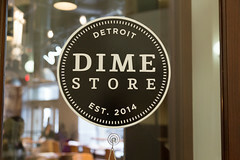 Overall, there’s a lot to said for Dime Store. It’s a nice addition to the formerly lean Detroit breakfast scene. 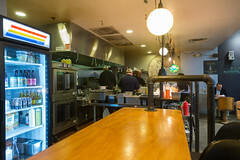 The food is very nicely executed by a friendly staff, with a nice open kitchen you can watch. And, quite frankly, the prices were pretty reasonable. I’d love to go back.